Gardeners in the northern climates need to plan carefully to provide year round interest in their landscape design. After the summer flowers fade and autumn leaves fall, the bare bones of the landscape in winter are visible for all to see. By planning ahead for the changing seasons and using winter's snow to highlight carefully selected plants and garden structures, we enjoy the year round views of our gardens. Designing a winter landscape offers opportunities for gardeners who showcase their green thumbs in spring and summer with the challenge of creating different views of landscape within the same garden space. 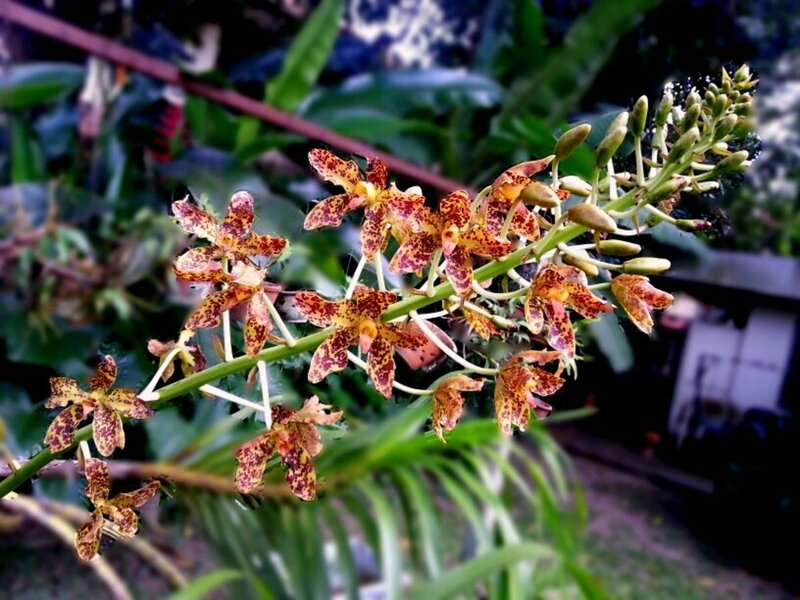 Our property is located in the Northeast where we get the full experience of all four seasons. The changing seasons provide us with the opportunity -- and challenges -- of creating a landscape that looks good throughout the year. Nature gave us a solid foundation of granite outcroppings and mature woodlands in a rural setting for dramatic backdrops, but gardeners with smaller plots to tend can use these winter landscape ideas to add visual interest and impact to their gardens during the colder seasons. Paths and walkways are prominent features in the winter landscape. The ever evolving design of our property includes lots of paths and walkways. Brick, stone, gravel and grass pathways wander through the gardens and around most areas of our yard. We use paths to define and separate garden spaces, and to create destinations such as the fire pit area or a secluded bench. Pathways are also functional for maneuvering wheelbarrows and other gardening equipment planting beds and for convenient yet utilitarian access to the chicken coop, goat pen and compost pile. 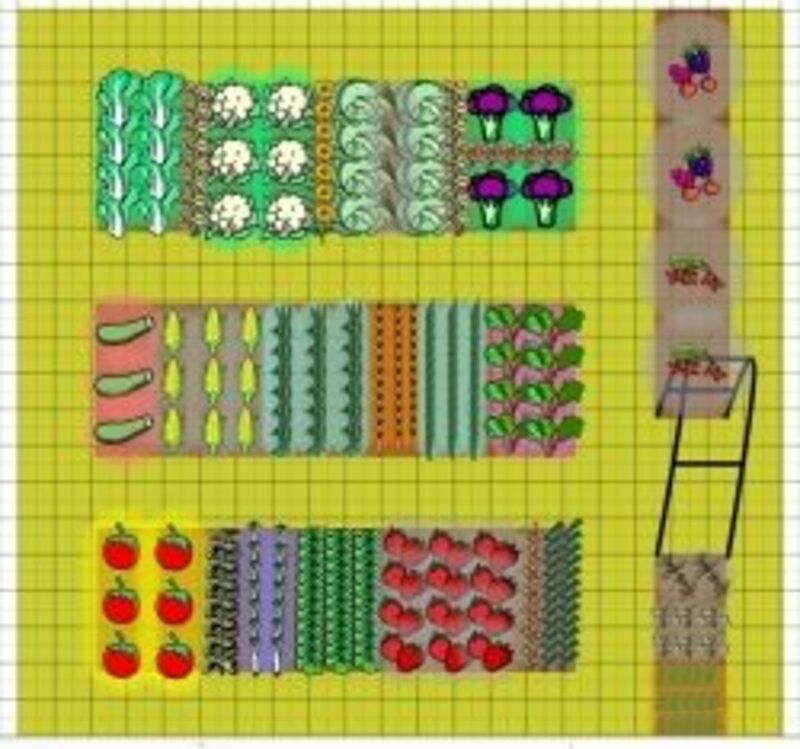 Paths can visually and physically to create separate areas, or to connect the different areas of the garden together. Using different materials to create walkways and paths adds a variety of colors and texture. The gravel paths are lined with a row of field stone, creating physical borders that define the edges of paths and planting beds. 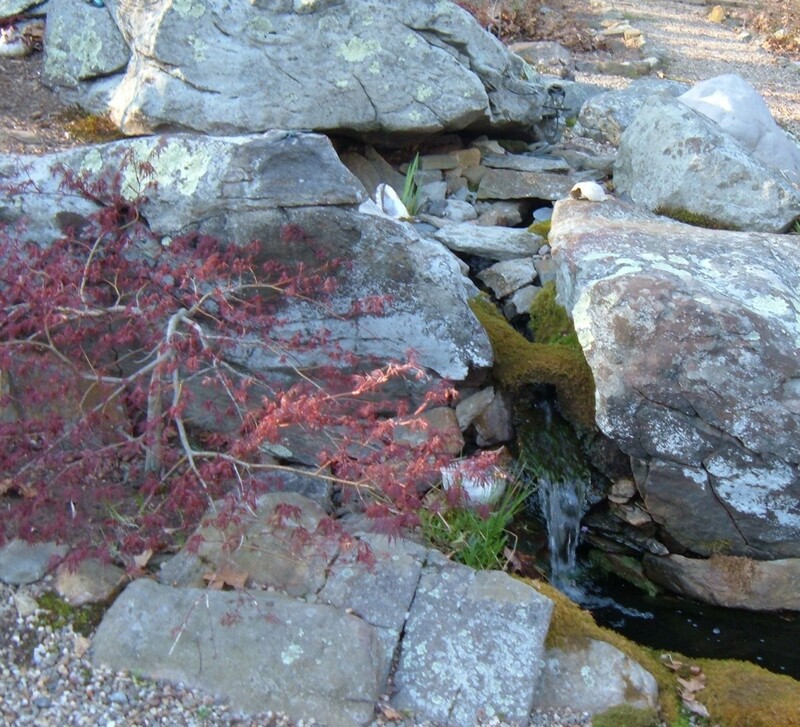 Carefully chosen and positioned rocks, boulders and other hardscape define the planting areas. 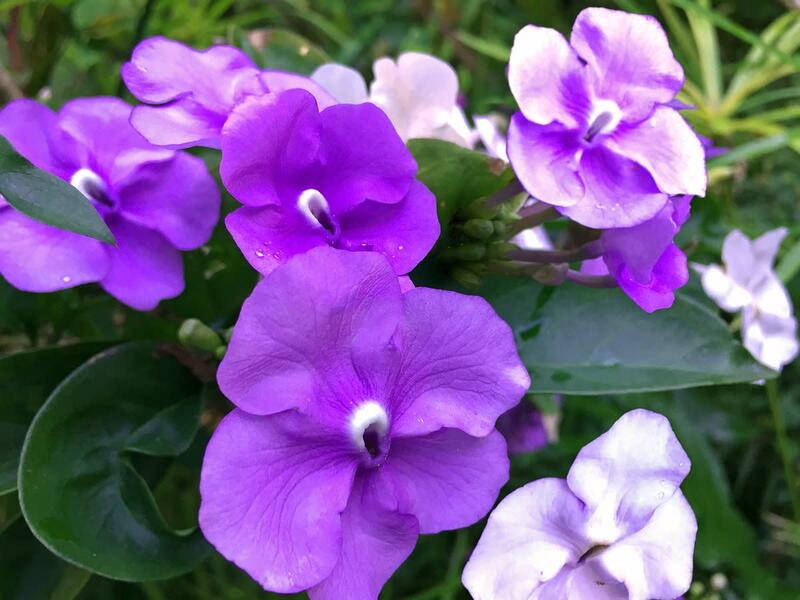 During the spring and summer months, the growing foliage introduces color and softens the edges. In the winter, the exposed edges highlight the pathways and planting bed, giving contrast and texture to the garden. Conifers and hollies are the evergreen stars of the winter landscape, bringing color and visual interest to the garden in all four seasons. The many different varieties of conifers offering plants in various sizes and in many shades of blues, greens and gold. 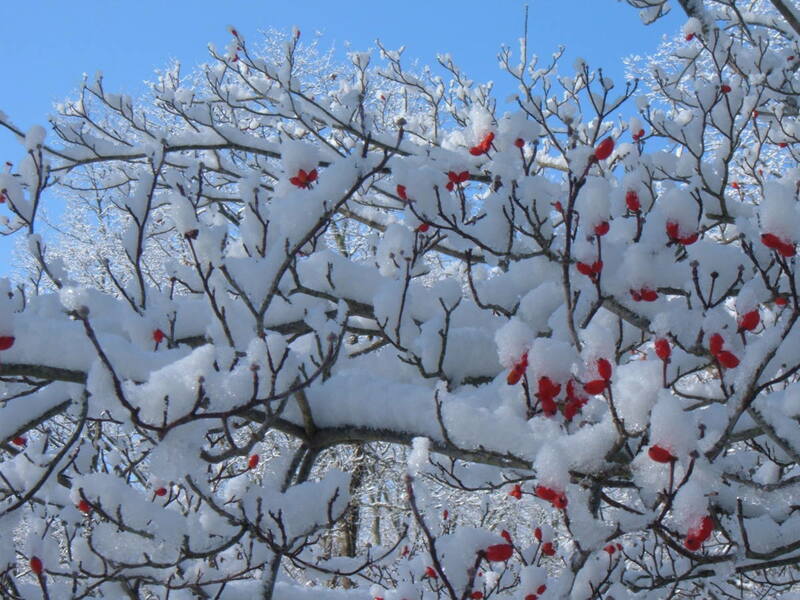 The bright red holly berries pops against the dark green foliage, attracting hungry birds and providing them with protection from the wind and snow. Just make sure to plant both male and female holly trees, or the female holly trees will not produce any berries. Plant large spruce and pine trees as specimen plants and focal points in the landscape, and position groupings of smaller evergreen bushes and shrubs to accent garden spaces and borders. Boxwoods are another favorite, planted as an evergreen hedge or mixed with other small trees and shrubs. Low growing junipers creep and spread around the rocks and along the paths, softening the hardscape borders evergreen fronds that provide four seasons of color and textures. Deciduous trees with interesting bark, branching shapes or winter berries are living sculptures. 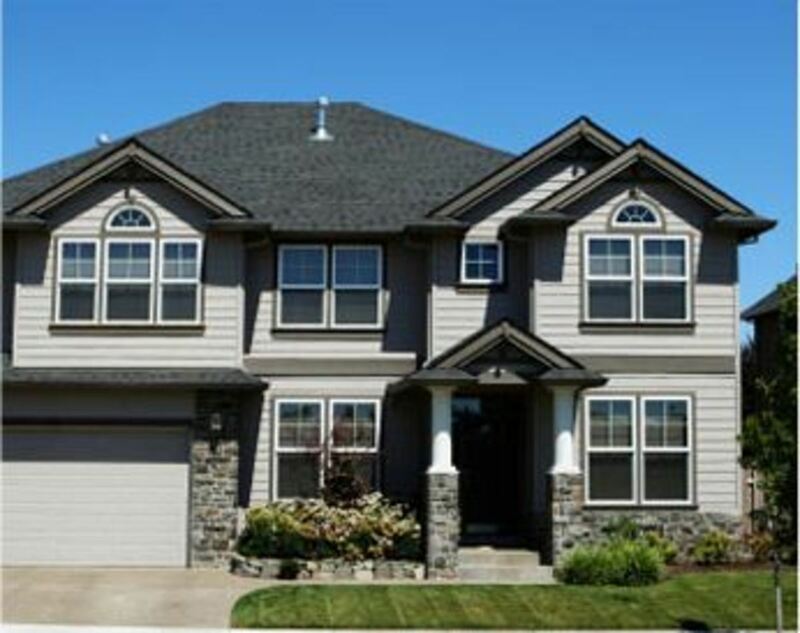 During the warmer months, shrubs and trees are the backdrops for colorful flowers and flashy foliage plants. As the cooler weather approaches, the leaves drop and the flowers fade, bringing the silhouettes of trees with their textured bark and curving branches to the forefront of the winter landscape. White birch trees with their peeling bark, and Japanese maples with arching branches create interest, especially against a snowy background. Native dogwoods are increasingly available and disease resistant, and produce winter berries for the birds to enjoy. After the flowers fade, leave the seed pods and stalks of perennial plants. The finches, chickadees and other feathered year round residents will pick the seeds clean, while snow covered stalks in a light breeze offer a beauty and movement that is quite different from the flowers and colors of summer. 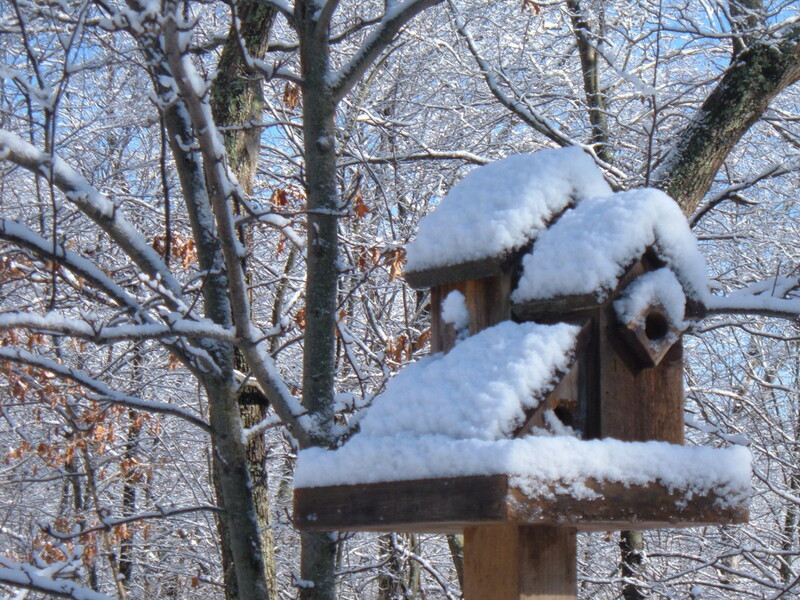 Add pieces of garden art, birdhouses and sculptures to perennial beds for winter impact. As the frost approaches and the flowers fade, the garden art moves into the spotlight. Traditional statues create a formal feeling, while eclectic and whimsical pieces can portray a free flowing sense of fun. Multipurpose items such as a toad house, either purchased or made from an inverted terra cotta flowerpot, adds a decorative charm while creating an inviting shelter for the little bug eaters. 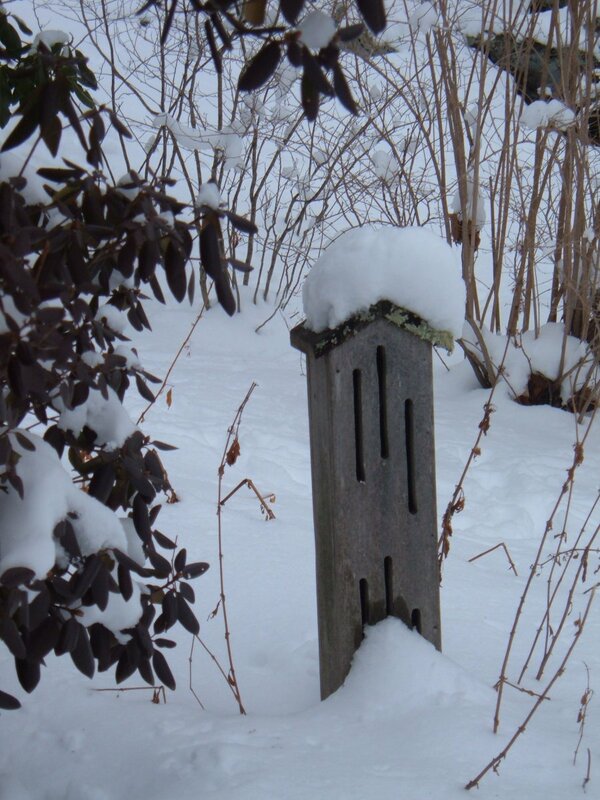 Smaller garden art pieces or those placed towards the rear of the garden gain prominence in winter as the foliage and flowers of summer fade away. 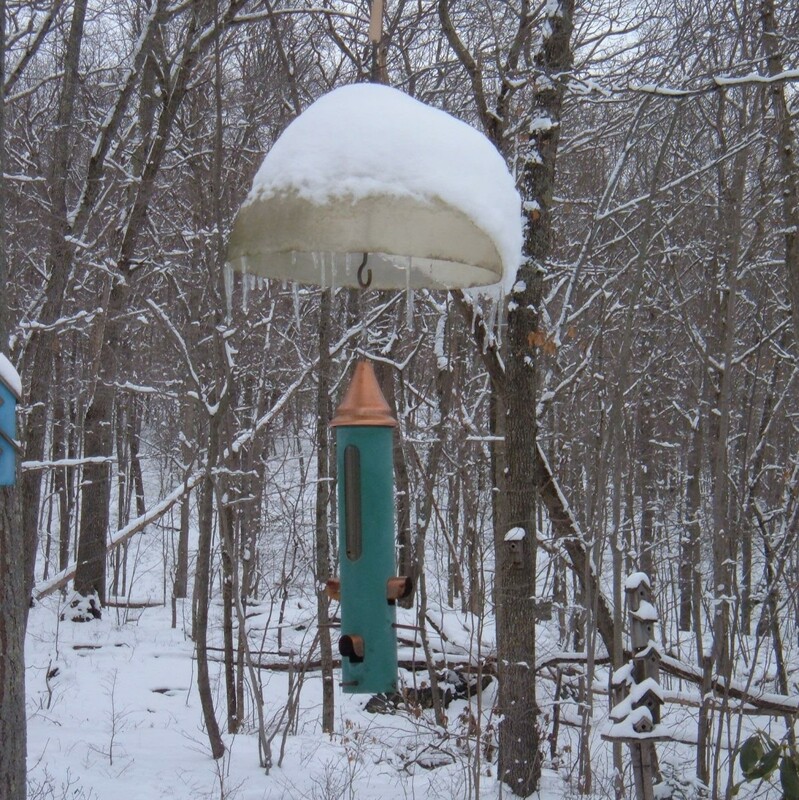 Feeding wild birds in winter provides an alternate food source during the time of year when natural foods are scarce and harder to find. Depending on where you live, many different and interesting types of bird may visit your feeders in search of an easy meal. During the cold weather, birds burn extra calories to keep warm and need high energy foods for fueling their body metabolism. Most winter resident birds are seed eaters, and using a variety of wild bird seed will attract a variety of different birds. Black oil sunflower seeds, thistle (nyger) seed, millet and safflower seeds attract nuthatches, chickadees, cardinals, finches, titmice, sparrows and more. Use cracked corn to attract wild turkeys, mourning doves and blue jays, while suet cakes attract woodpeckers. Perching birds such as sparrows, chickadee and finches will visit hanging bird feeders filled with thistle and sunflowers seeds, while cardinals and mourning doves prefer tray feeders, and woodpeckers cling to the wire mesh of suet feeders. Offering wild bird seed, a consistent water source and shelter from the elements will attract a variety of wild birds to visit your garden throughout the fall and winter months. Providing a variety of feeders filled with different types of wild bird seed attracts different species of wild birds. Hanging multiple bird feeders in different locations and hung at different heights reduces competition between the birds. Watching the wild birds flock around the feeders brings color and movement to the winter landscape, and the cheery chirps add their music to the scene. 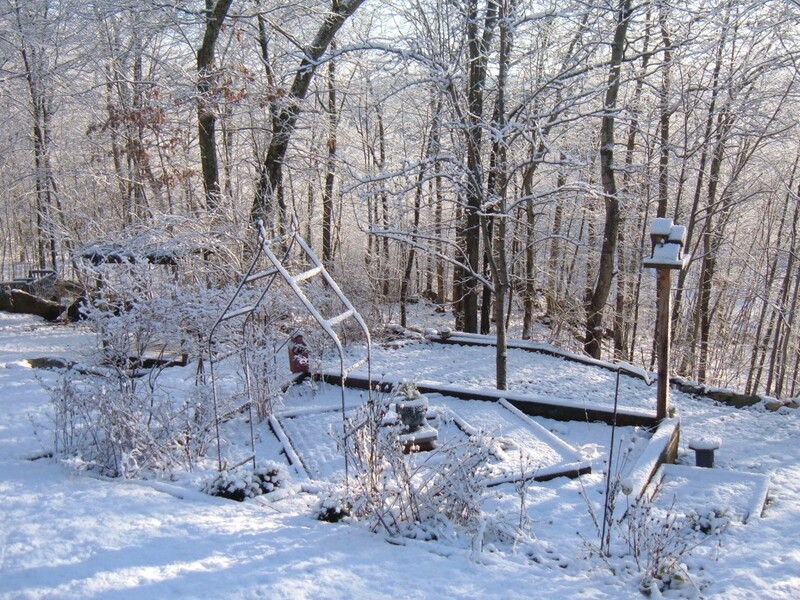 Garden features such as ponds, arbors and structures take on other personalities in winter. Icicles hang from bird feeders and planter boxes, reflecting prisms of sunlight before melting away. Though a little difficult to see in this photo, this small waterfall is splashing through the skim ice, creating an island of open water in our garden pond for the koi and goldfish below. 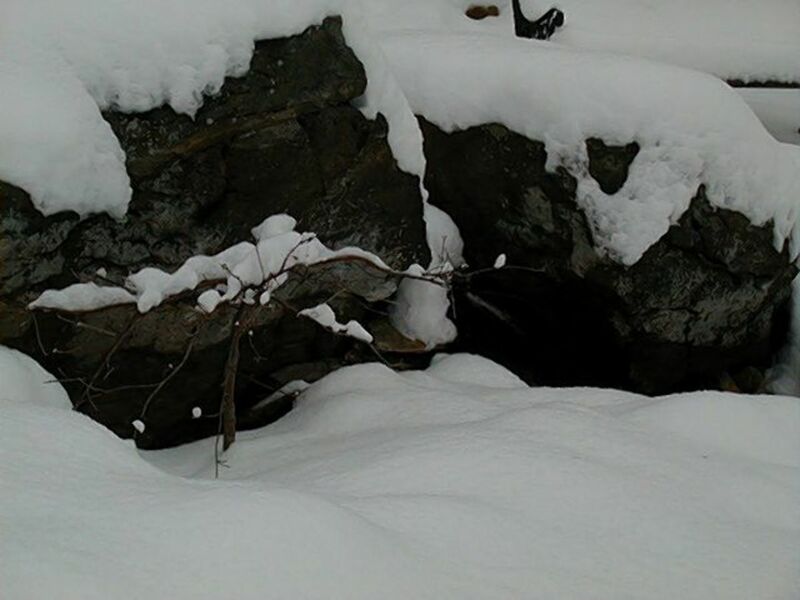 Birds, squirrels and other winter visitors to the garden find drinking water in the small running stream. 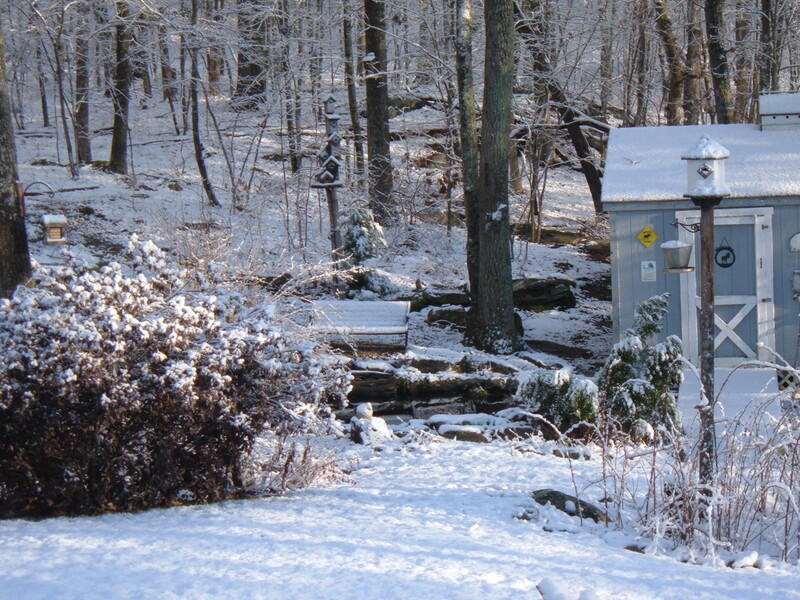 The photo to the right is taken from approximately the same spot in the yard as the photo of the snow covered stream and waterfall above, highlighting the changing views and vantage points as the seasons change. 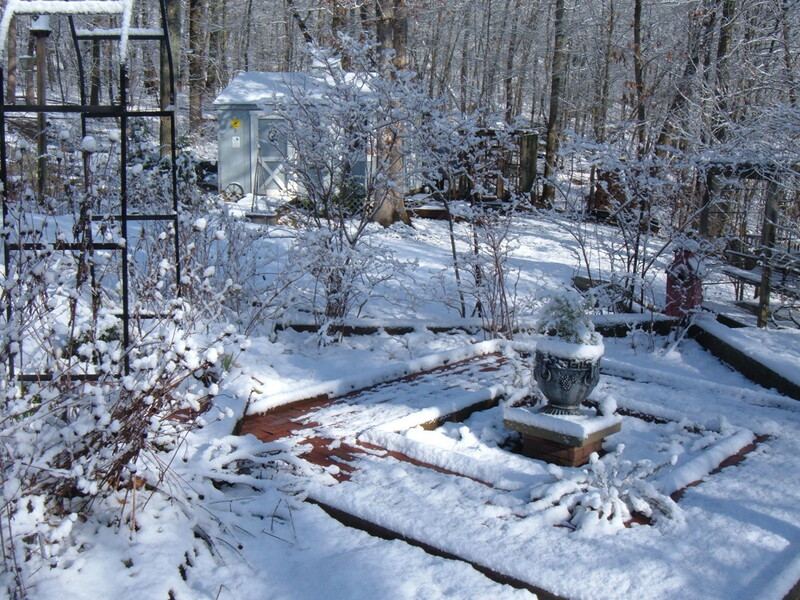 The winter landscape offers gardeners with opportunities to showcase not only their green thumbs in spring and summer, but also the challenge of creating a completely different alternate winter landscape - in the same garden space. 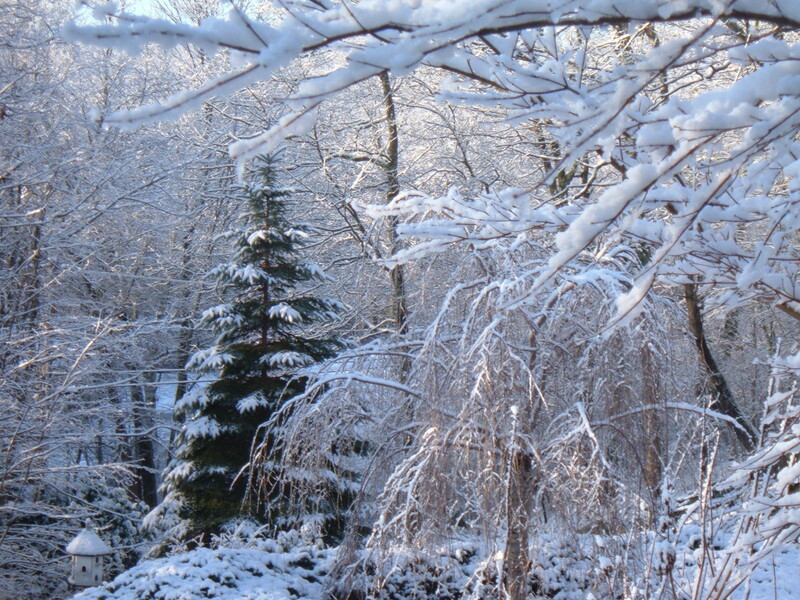 Did You Design Your Garden with Winter in Mind? Create a destination point and gathering spot in the winter garden by building an outdoor fire pit. On crisp evenings and chilly afternoons, the warmth and flickering flames beckon folks to venture outside and into the garden. 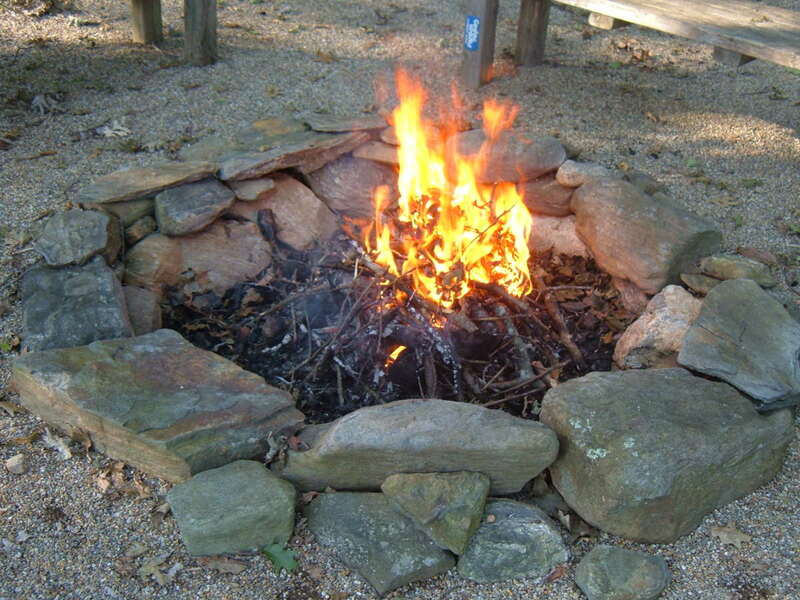 Situated in the backyard and surrounded by mature woodlands, this fire pit is made of fieldstones collected from the rocky outcroppings found around the property. The natural coloring and shapes of stacked fieldstone adds architectural interest and texture the fire pit design, and it fits in well with the rural woodlands of New England. The cleared site for the outdoor fire pit is approximately 20 feet across and has a layer of pea gravel covering the ground to contain sparks and embers. The pathways through the woodland gardens and leading to the fire pit area are covered with pea gravel too, making it ear to access the fire pit area throughout the year. Gone South for the Winter, See You Next Spring! Beautiful and informative lens! Congrats on your purple star. Winter can be so beautiful as you clearly show. Some inspiring ideas. Lovely lens about enjoying the outdoor garden space in the winter. I like the reminder about leaving the dead plants for the birds to pick out during bad weather! 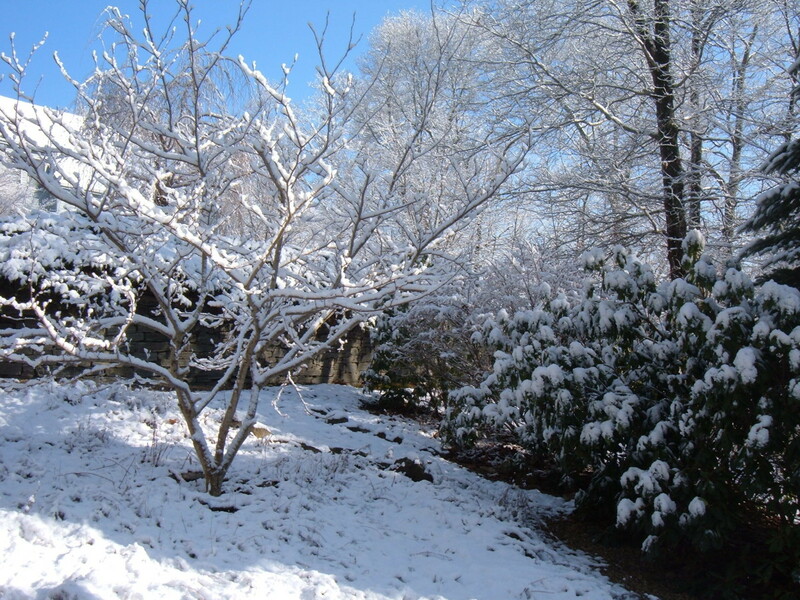 Beautiful photos of a winter yard and garden. I like planting things that add color to a garden for all seasons. Your suggestions would work well in my yard. Thanks. We are working on the 4 season landscape in our Vermont gardens. I like your ideas, and have one of the same books you recommend. Lovely photos and gardens! I never thought about winter landscape until now, Thanks for sharing your ideas I guess I'm going to leave my perennials for the birds next year. Wonderful pictures!!! I never really though about leaving my perennials so the birds could eat the seeds. Good idea. Beautiful photos, love to see the snow all around.Are you having a white Christmas?Wishing you are Merry Christmas and a happy new year. 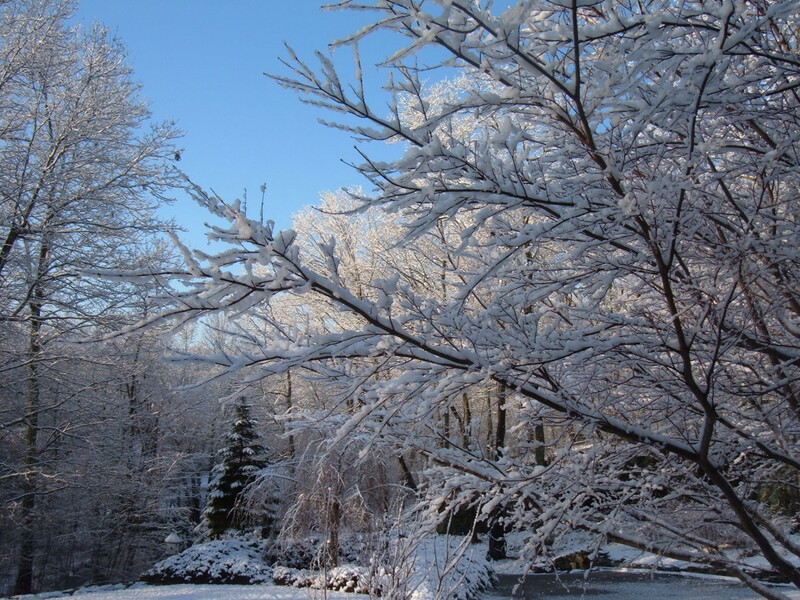 Enjoyed your photos and great winter backyard ideas. Some great ideas here - thanks for sharing! I like your backyard! What a great lens! Enjoyed the photos and the ideas. Thanks for sharing it. A very interesting and informative lens! Thank you!